During the last Level Two training, one of the clients presented with a really interesting situation. He had surgery on his leg , specifically a repair to the Achilles tendon. The surgeon decided to reinforce the Achilles tendon by cutting the tendon of the Flexor Hallucis Longus and attaching it to the calcaneus. 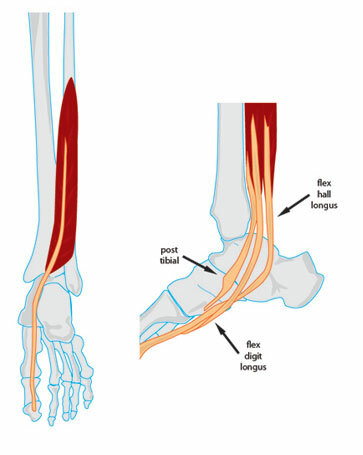 In this way, the Flexor Hallucis was an added support to the Achilles, running right next to it. What is fascinating is that even though the surgeon rerouted the tendon, the brain hadn't quite rerouted the signal yet. When he tried to flex his big toe, the client felt a tug on the top of his heel. There was movement in the big toe, produced by the much weaker Flexor Hallucis Brevis. When his brain gave the order to flex the big toe, both muscles fired, as they normally would. It's just that one of the muscles, the longus, now has a different attachment. I assume that over time the brain will figure out how to reroute the signal. In the meantime, it is quite a novel feeling for him. Fascinating!